On this date in 1895, Carl Schenck arrived from Germany to the United States to replace Gifford Pinchot as forester at the Biltmore Estate in Asheville, North Carolina. Three days after arriving in New York, Schenck met with Pinchot, then just 29 years old and seemingly without a care in the world. 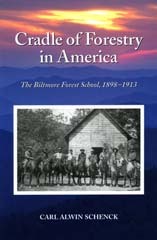 To mark the anniversary, we offer this excerpt from his memoir, Cradle of Forestry: The Biltmore Forest School, 1898-1913.In it, Schenck shares an immigrant’s wide-eyed reaction to a bustling New York. The reader also gets a peek into the charmed life of Pinchot, who would later be first chief of the U.S. Forest Service. On April 5, 1895, I passed the Statue of Liberty and was received in Hoboken at the docks of the North German Lloyd Lines by my friends and cousins, George Merck and his wife, residents of New York since 1893. They were overjoyed at my coming. Their son, George W. Merck, who as I write is a director of the American Forestry Association, was just one year old. I was taken in a horse-drawn cab, with the help of a ferry, to New York and to their residence on Eighty-sixth Street. In the afternoon George Merck drove me in a buggy through Central Park. There were thousands of buggies, and they seemed to me more admirable than any of the trees in the park and more attractive than the entire bank of the Hudson River, including the Grant Memorial. I recall that everybody craned his neck whenever a woman riding on a bicycle was seen—apparently a new sensation for New York in 1895…. On the third day after my arrival in the United States, Pinchot came to the Merck home and picked me up for a day to be spent in New York City. He was good looking. His shining black eyes and black mustache betrayed his French origin…. Gifford Pinchot appealed to me as the most lovable companion I could desire. To begin with, we inspected the city of New York, riding in horsecars, cable cars, and on the new elevated railroad. In those days electric lines did not exist. We visited the American Museum of Natural History, where we saw the Morris K. Jesup collection of native American woods. O Lo! The biggest trees I had seen in the Spessart and int he Black Forest were mere babies when compared to the gigantic dimensions of American trees. In the course of our trip we visited a large store, Rogers Peet Company, where there could be had all and everything that a gentleman might require for society, for business, or for sport. I was amazed when Pinchot selected, without askeing the prices, several sport suits, the finest touring shoes, some tents, and some fishing tackle. Obviously, he was well known at the store. He himself was clad in black, from neck to foot. Apparently he was in mourning; but his cheery eyes were in strict contrast with his mourning attire. At noon he took me to his home, a patrician house in Gramercy Park. Upon entering, Pinchot introduced me to his father as George Vanderbilt’s new forester and added that he had invited me to have lunch with the family. Much to my astonishment, the elder Pinchot replied, without looking at me and without giving me a hand: “No, it does not suit us today; you have to take him elsewhere.” Undismayed by his father’s brusqueness, Pinchot left the house with me at once and took me to his Yale Club for lunch. Subsequently Pinchot and I met at various places and for various purposes. Queerly, the task awaiting me at Biltmore was scarcely touched on in our conversations, which were restricted to discussions of hunting and fishing…. Seeing me off at the depot in the evening, Pinchot paid me this compliment: “Dr. Schenck, I believe you are just the right man for the position.” Then he added, “You will be forester and I shall be chief forester during your term of employment.” He had promised to go to Biltmore in the near future and to discuss with me all the problems on the spot. I was happy, indeed, to be able to work under him on the Biltmore Estate and under his responsibility. Little did Schenck know that his “lovable companion” soon would be trying to undermine Schenck and his Biltmore Forest School, going so far as to denounce Schenck as an “antichrist.” Want to know more about this bitter rivalry for control of the future of American forestry? Then read Cradle of Forestry today!